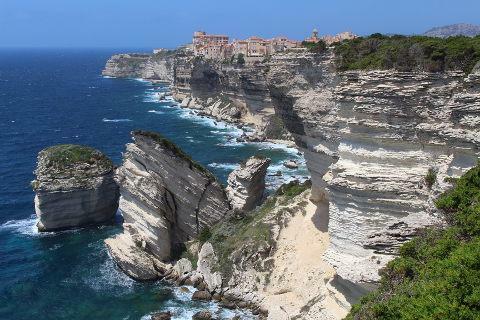 The town of Bonifacio is at the southern tip of Corsica (just 12 km from Sardinia) which help give Bonifacio and its harbour a rather exclusive, sophisticated Italian feel - above all around the elegant quay with its palm trees and expensive restaurants. ...so be sure to allow time to simply sit on a cafe terrace and relax! Start your visit with a stroll around the natural harbour, admiring the yachts and fishing boats that are stationed here. From the port you can also organise your boat trips along the coast or a ferry south to visit Sardinia. We enjoyed the short tour - you get lovely views back onto the town, as well as a good view of the amazing cliffs and small beaches nearby. 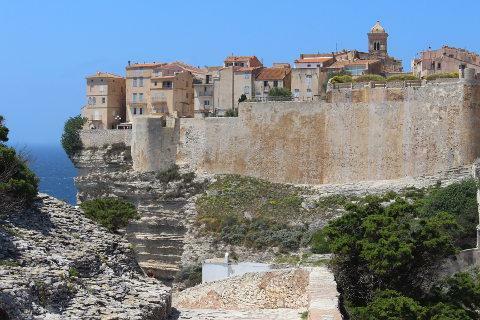 Climb next to explore the citadel and historic old town of Bonifacio. Although the climb is quite step you are rewarded with lovely coastal views to distract attention from your legs! 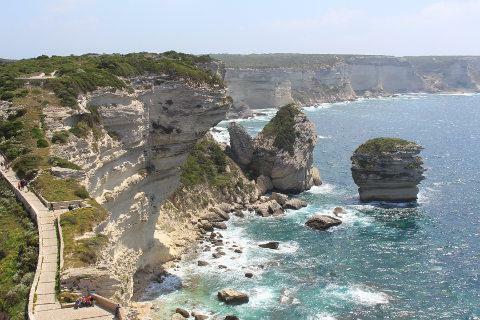 Bonifacio is set high on sheer white cliffs which continue around the coast. You can see the famous 'grain of sand' rock in the sea just off the coast from here. 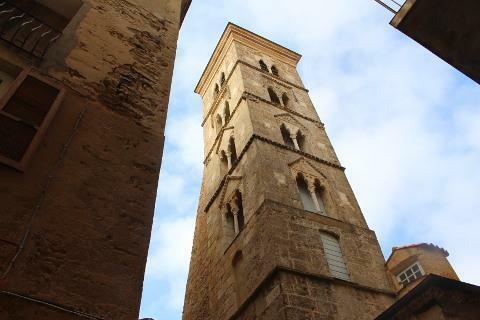 Pass through a gateway through the the original walls to discover a picturesque warren of narrow streets and alleys enclosed by the sturdy walls of the citadel. Keep an eye out for the house where Napoleon spent a couple of months with relatives as you wander the streets (Rue des Empereurs). 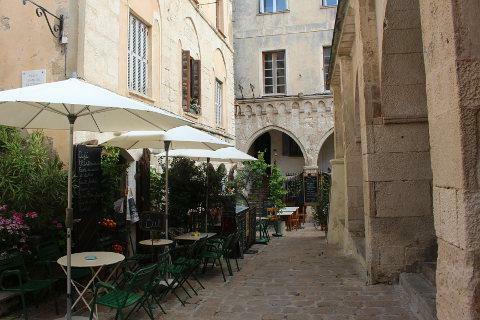 This medieval old-town in Bonifacio is the oldest town in Corsica and has many tall houses along cobbled streets in a spectacular setting along the top of the cliffs of the white limestone peninsula. The town is split into two main parts with the main town near the main gateway and then a walk to the end of the peninsula here there are military fortifications and a cemetary which is the most southerly in Europe and one of several in France which are built in magnificent locations overlooking the coast, the perfect place to be buried! 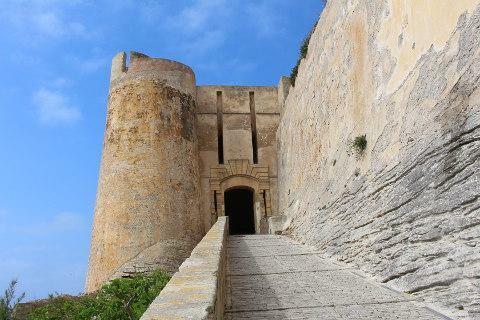 Another popular site in Bonifacio is the 'Staircase of the King of Aragon', a steep staircase cut into the cliff below the old town. A small entrance charge is payable but the staircase is highly recommended. Be warned though it is very steep and the steps are uneven. The highlight for us turned out to be the walk up the hillside opposite the citadelle for some incredible view over the citadelle and the white limestone cliffs. When you visit Bonifacio on an evening the citadelle and some of the cliffs are illuminated giving them a quite different atmosphere to that of the daytime. The region around Bonifacio is perhaps best known for having some of the most magnificent beaches on the island - indeed some of the best in the Mediterranean (see also Corsica beaches) - including those at Palombaggia and Saint Giulia. The beach at Rondinara, in a perfect natural bay, is simply stunning. 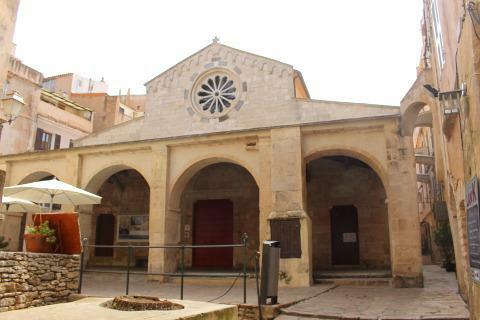 The town is a major centre for sea based leisure activities such as yachting and diving. 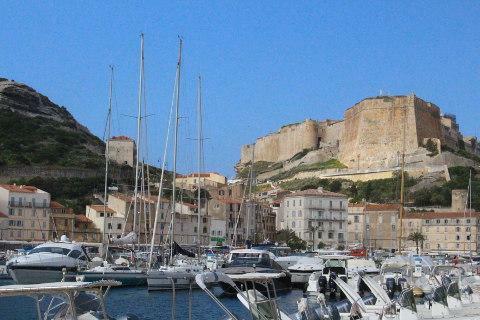 Be aware that the success of the yachting is partly due to the fact that Bonifacio is one of the windiest places in France! 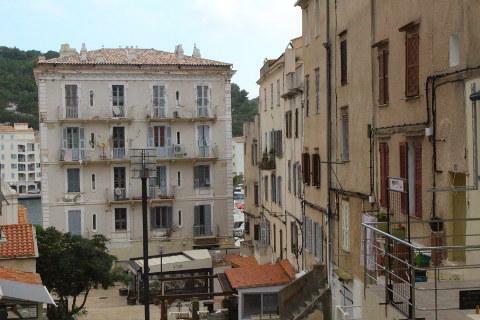 The setting of Bonifacio, the attractive beaches nearby and other local activities does mean the town gets rather busy in the summer months - not unusual in many of the towns in Corsica - but it is still highly recommended.